A Hidden Japanese Gem Called "Sumiya"
Who would have thought that in STC (Senayan Trade Center) there is an actual Japanese restaurant worth eating? Hidden among the bustle of electronics & air soft-gun shops at the Ground Floor, this is exactly where Sumiya is located. Sumiya is said to be an authentic Japanese restaurant and I’ve heard some really good praises on it in social media. But just how ‘authentic’ is authentic? I went there on some dinner time to find out. When I first walked in and entered the restaurant, it immediately didn’t feel like I’m in STC, at all. Heck, it doesn’t even feel like I’m in Jakarta. Everywhere I look, there were more Japanese men than our locals. Beneath the dimly lit and busy waiter shouting & fast movements I could almost hear the chit-chatty buzz in pure Japanese language in entire room. I immediately took conclusion that lots of Japanese expatriates love to hang out here after office hours. That also means, I should expect that the damage cost will also be higher than your regular Japanese restaurant chain. Prepare around IDR 150-200k per person because, if you’re like me, I don’t think you can hold back on ordering again and again after they send out the 1st menu simply because they’re.… too beautiful. Like all Japanese meal course, we started off with Sashimi and Salads. Salmon Sashimi (IDR 63k) – Fresh and thick salmon cuts are being stacked up and garnished with white & yellow radish, kyuri, and some Japanese herbs; and finally being served on a bed of ice. It’s definitely my first Sashimi on a Bed of Ice! Other than beautiful plating, the point is that they want you to enjoy salmon at the freshest, best temperature. Little thing like this is something that made me smile and I just knew it right away, I made a great decision by giving Sumiya a try. Maguro Avocado Tar-tar Salad (IDR 58k) – Again, it’s only the 2nd thing that we ordered and it came out as beautiful as if we’re doing sky-dining. Fresh maguro (tuna) with diced avocado are glued together with light mayo cream and molded into rounded tall shape with garnishes on top, served with 3 thinly sliced baguette and mixed vegetable salad on the side. With this, they want you to eat them as if you’re eating Italian bruschetta – take a slice of baguette, spread some avocado tuna, and finish them off with vegetable salad on top. Shioiri Gin-Nan | Roasted Ginkgo Nuts (IDR 43k) – I wasn’t sure if I tasted ginkgo nuts before, what I know for sure is that Ginkgo (or Gingko) as in Ginkgo Biloba, have medicinal and aphrodisiac properties that is good for your brain memories, if eaten regularly and at sufficient quantity. For Japanese, apparently roasted and salted ginkgo nuts is a popular Izakaya (Japanese bar) snack. What I tried at Sumiya was really tasty. The ginkgo(s) have an outer shell almost like pistachio, but the insides are quite soft like chestnuts and sometimes a little bit bitter. If you make a trip to Sumiya make sure this is on your list. Try their Roasted Ginkgo on A Skewer instead! Mentaiko Tororo Teppanyaki | Fried Grated Yam on Hot Plate, with additional Cod Roe Topping (IDR 53k + 14k) – This reminds me of okonomiyaki except that there is no cabbage. This is more like pancake made of flour and grated yam, blend together with Mentaiko (cold cod roe) and Negi (Japanese small scallions) and cooked on top of a hot plate. It is to be eaten with a dipping shoyu sauce. The texture is so soft everything just melts in your mouth! I could eat the whole thing by myself. Kaibashira Horenso Butter Itame | Butter Fried Scallop & Spinach (IDR 53k) – I figured, just by looking at the ingredients we would all know how it tastes, right? Scallop. Japanese Spinach. Butter. Sizzling hot. Crunchy bites of perfectly cooked horenso, with buttered scallop. Awesome combination! Spicy Tofu Nabe – When you’re in meal-course with no major carbs consumption like what I had, in the end you knew that you needed something soupy to fill up the stomach tank. This tofu nabe has a quite generous portion enough to feed 3 people. One hearty pot consists of tofu, kimchi, chives and everything else that I couldn't really identify. The broth really kicks in! Spicy, refreshing, and fulfilling. Now here comes the part where everything just makes sense. 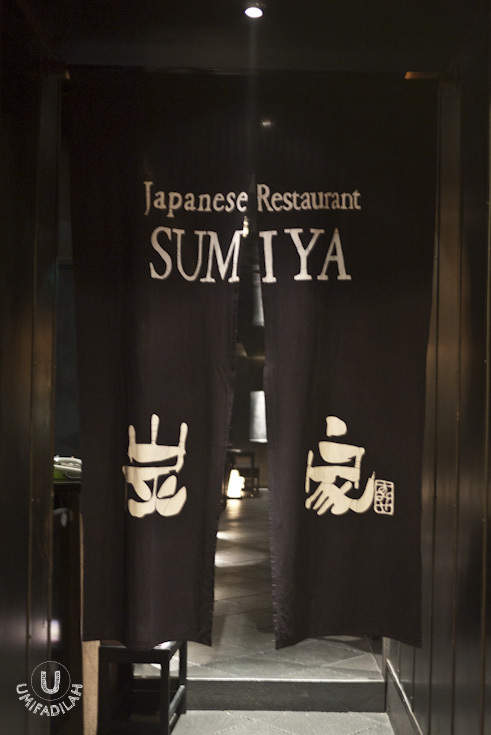 Sumiya, the restaurant itself is being named after ‘Sumi’, Japanese charcoal. Which is why the main featured menus in here are basically everything grilled. One of the most popular menu category is Sumibi Yaki (literally means ‘Charcoal Grilled’). You can choose between 16 different types of chicken yakitori at around IDR 15k each, from its thigh, skin, liver, gizzard, heart, hip, wing, neck, breast and its variation. For grilled beef menu, the option is limited to only 4 menu: tongue, striploin, and beef rolls in enoki/asparagus. Kawa / Chicken Skin (IDR 15k) – It was actually my friend’s order because I don’t eat chicken skins, but she said it’s SUPER GOOD you just have to try it if you’re a skin lover. It’s crispy enough at the edges being post-grilled but it also has that soft & slimy texture when you chew in. 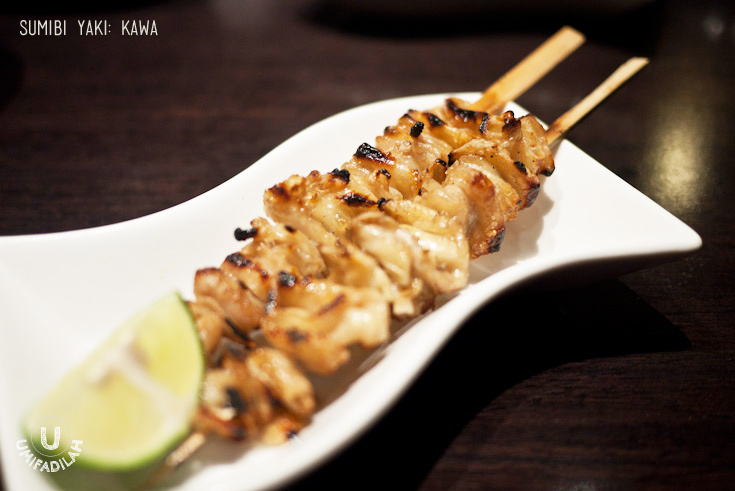 It looks perfect and way better than Chicken Skin Satay founded on most street food carts. (.... D'OH, OF COURSE? Hahaha). Sasami Cheese (IDR 16k, on your left) – Grilled chicken breast, with cheese. A good type of cheese. And juicy breast chunks seasoned with Himalayan salt. Can you ask for a better one? I don’t think so. Sasami Shiso Ume (IDR 16k, on your right) – Grilled chicken breast, now with sour plum and thinly sliced herbs on top to neutralize the flavor, I guess. I never had any problems with sour plum, so this one was a nice addition to the chicken breast. Gyu Tan (IDR 59k) – This is beef tongue cut in bite-sized chunks, seasoned with their signature Himalayan salt, grilled to perfection and served with green chili paste and calamansi lime on the side. Squeeze the lime, and dip the Gyu Tan chunks on the dipping bowl, and it might surprise you. I don’t know, but the interplay of soft yet meaty texture, acidity, and tangy chili paste just awakens my taste bud. I think some might like them, while some might find it too adventurous. Free-flow cold ocha. Wasn't sure if this was free or not, lol. Umeshu Soda (IDR 48k) - Vodka with plum liqueur. There were only 3 of us at that time and the total damage cost for this was around IDR 240k each. I know, it went way out of our budget but it's just hard not to look at their menu over and over again. Looking at something like this written, how can you not be intrigued to try?